Hamas leader complains to UN about US and Israel attempts to condemn Hamas. Danon: It's like a serial killer asking police for assistance. 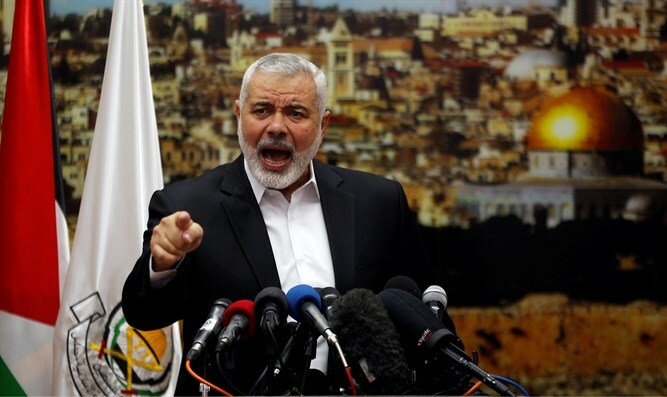 Ismail Haniyeh, the head of the political bureau of the Hamas terrorist organization, on Wednesday night wrote a letter to the United Nations General Assembly president, Maria Fernanda Spinosa, in response to the US and Israel's efforts against Hamas in the UN. The United States has been leading a push at the United Nations to win backing from European countries for a resolution condemning Hamas. The General Assembly is expected to vote in the coming days on the proposed resolution which will condemn rocket firings into Israel and demand that Hamas end its use of violence. In his letter, Haniyeh claimed he is "following up with great anger and condemnation the ongoing and miserable efforts by the United States of America, not only by adopting the Israeli narrative of the conflict, but also by providing all the necessary material and moral support for the Israeli occupation to continue its aggression against our people and deprive them of their basic rights of freedom, independence and self-determination." He further claimed that Hamas would "greatly count on the members of the UN General Assembly [to] stand by international legitimacy in support for the right of peoples to defend themselves and thwart these aggressive American endeavors." He then stressed the need for "hard work to thwart the American efforts to condemn the resistance" at the UN. Israel's Ambassador to the UN, Danny Danon, said in response that "Hamas speaks about international law while it fires rockets into civilian populations, holds the bodies of IDF soldiers and Israeli citizens, and uses its own people as human shields. A terrorist organization going to the UN for assistance is like a serial killer asking the police for assistance. Israel and the United States will continue to mobilize the countries of the world into a united front against the terrorism that Hamas engages in on behalf of Iran."